1. a knot or knotlike mass; in anatomic nomenclature, a group of nerve cell bodies located outside the central nervous system. The term is occasionally applied to certain nuclear groups within the brain or spinal cord, such as the basal ganglia. 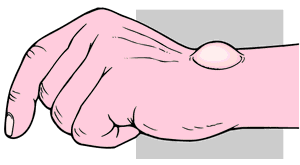 2. a form of cystic tumor occurring on an aponeurosis or tendon, as in the wrist. adj., adj gan´glial, ganglion´ic. Ganglion. From Frazier et al., 2000.
autonomic ganglia aggregations of cell bodies of neurons of the autonomic nervous system; the parasympathetic and the sympathetic ganglia combined. cardiac ganglia ganglia of the superficial cardiac plexus under the arch of the aorta. carotid ganglion an occasional small enlargement in the internal carotid plexus. celiac ganglia two irregularly shaped ganglia, one on each crus of the diaphragm within the celiac plexus. cerebrospinal ganglia those associated with the cranial and spinal nerves. 1. any of the three ganglia (inferior, middle, and superior) of the sympathetic trunk in the neck region. 2. one near the cervix uteri. cervicothoracic ganglion a ganglion on the sympathetic trunk anterior to the lowest cervical or first thoracic vertebra. It is formed by a union of the seventh and eighth cervical and first thoracic ganglia. Called also stellate ganglion. cervicouterine ganglion one near the cervix uteri. ciliary ganglion a parasympathetic ganglion in the posterior part of the orbit. cochlear ganglion the sensory ganglion located within the spiral canal of the modiolus. It consists of bipolar cells that send fibers peripherally to the organ of Corti and centrally to the cochlear nuclei of the brainstem. Called also spiral ganglion and Corti's ganglion. craniospinal ganglia collections of sensory neurons that form nodular enlargements on the dorsal roots of the spinal nerves and on the sensory roots of cranial nerves. dorsal root ganglion spinal ganglion. false ganglion an enlargement of a nerve that does not have a true ganglionic structure. Frankenhäuser's ganglion cervical ganglion (def. 2). geniculate ganglion the sensory ganglion of the facial nerve, on the geniculum of the facial nerve. ganglion im´par a ganglion commonly found on the front of the coccyx, where the sympathetic trunks of the two sides unite. 1. the lower of two ganglia of the glossopharyngeal nerve as it passes through the jugular foramen. 2. the lower of two ganglia of the vagus nerve as it passes through the jugular foramen. jugular ganglion superior ganglion (defs. 1 and 2). Ludwig's ganglion a ganglion near the right atrium of the heart, connected with the cardiac plexus. lumbar ganglia the ganglia on the sympathetic trunk, usually four or five on either side. otic ganglion a parasympathetic ganglion next to the medial surface of the mandibular division of the trigeminal nerve, just inferior to the foramen ovale. Its postganglionic fibers supply the parotid gland. parasympathetic ganglia aggregations of cell bodies of cholinergic neurons of the parasympathetic nervous system; these ganglia are located near to or within the wall of the organs being innervated. See also Plates. petrous ganglion inferior ganglion (def. 1). pterygopalatine ganglion a parasympathetic ganglion in a fossa in the sphenoid bone, formed by postganglionic cell bodies that synapse with preganglionic fibers from the fascial nerve via the nerve of the pterygopalatine canal. Called also sphenopalatine ganglion. sacral ganglia those of the sacral part of the sympathetic trunk, usually three or four on either side. sensory ganglion any of the ganglia of the peripheral nervous system that transmit sensory impulses; also, the collective masses of nerve cell bodies in the brain subserving sensory functions. simple ganglion a cystic tumor in a tendon sheath. spinal ganglion the cerebrospinal ganglion on the dorsal root of each spinal nerve; called also dorsal root ganglion. submandibular ganglion a parasympathetic ganglion located superior to the deep part of the submandibular gland, on the lateral surface of the hyoglossal muscle; its postganglionic fibers supply the sublingual and submandibular glands. 1. the upper of two ganglia on the glossopharyngeal nerve as it passes through the jugular foramen. 2. the upper of two ganglia of the vagus nerve just as it passes through the jugular foramen. Called also jugular ganglion. sympathetic ganglia aggregations of cell bodies of adrenergic neurons of the sympathetic nervous system; these ganglia are arranged in chainlike fashion on either side of the spinal cord. See also Plates. thoracic ganglia the ganglia on the thoracic portion of the sympathetic trunk, 11 or 12 on either side. trigeminal ganglion a ganglion on the sensory root of the fifth cranial nerve, situated in a cleft within the dura mater on the anterior surface of the pars petrosa of the temporal bone, and giving off the ophthalmic and maxillary and part of the mandibular nerve. Called also gasserian or semilunar ganglion. tympanic ganglion an enlargement on the tympanic branch of the glossopharyngeal nerve. vestibular ganglion the sensory ganglion of the vestibular part of the eighth cranial nerve, located in the upper part of the lateral end of the internal acoustic meatus. Called also Scarpa's ganglion. wrist ganglion cystic enlargement of a tendon sheath on the back of the wrist. the largest and highest group of prevertebral sympathetic ganglia, located on the superior part of the abdominal aorta, on either side of the origin of the celiac artery; consists of postsynaptic sympathetic neurons the unmyelinated axons of which innervate the stomach, liver, gallbladder, spleen, kidney, small intestine, and ascending and transverse colon. The largest and highest group of prevertebral sympathetic ganglia, located on the superior part of the abdominal aorta, on either side of the origin of the celiac artery; contains sympathetic neurons with unmyelinated postganglionic axons that innervate the stomach, liver, gallbladder, spleen, kidney, small intestine, and ascending and transverse colon. Raymond de, French anatomist, 1641-1715.
valve of Vieussens - a prominent valve in the great cardiac vein where it turns around the obtuse margin to become the coronary sinus. Willis pouch - obsolete term for lesser omentum.